Whether eaten as cartoon character gummies as a kid or swallowed as a regular pill as an adult, most people have taken multivitamins at some point in their life. According to a recent survey conducted by the U.S. Centers for Disease Control, over half of American adults report that they take dietary supplements, and multivitamins are the most common supplement reported. But how much do we really know about multivitamins? Are we making wise choices with our purchases? Are we getting the full benefits of taking these supplements? To maintain proper health, your body needs over forty different nutrients every day. The best way to get these nutrients is through the foods you eat. While eating a balanced diet will likely fulfill these nutritional requirements, the reality is that ensuring you get the nutrients you need on a daily basis is a challenge. This is where multivitamins come into play. While a multivitamin does not fully compensate for rigid dieting or poor food choices, it does help fill in nutritional gaps left by eating a less-than-ideal diet. Multivitamins also defend against deficiencies. According to the most recent U.S. Dietary Guidelines report, most Americans are deficient in potassium, calcium, and vitamin D due to inadequate intake of these nutrients. Multivitamins contain all of these nutrients and more. Incorporating a supplement into your daily regimen will greatly reduce the likelihood of having any of these common deficiencies. Those with a specific diet–such as being a vegetarian or vegan—are susceptible to other kinds of nutritional deficiencies. Iron and vitamin B12 deficiencies are common among this group. Multivitamins contain both of these essential nutrients. If you know that you are prone to certain deficiencies, you may also consider adding an additional supplement for that specific nutrient. For example, a vitamin B12 deficiency can lead to a serious condition called pernicious anemia, which is why many vegetarians take additional B12 supplements. 1. Read the label. This almost goes without saying, but you want to read the label to see what kinds of nutrients are contained in the multivitamin and their percentages. Reputable vitamins will have all of this information as well as the ingredients. 2. Get a vitamin that supplies 100 percent Daily Value for most nutrients. You do not want a vitamin that exceeds this number because that increases your risk of overdosing. You also do not want a vitamin that does not have enough nutrients to be effective. Remember that some nutrients–such as magnesium and calcium–are rarely included at 100 percent. These minerals are bulky and adding more would make the pill too large to swallow. 3. Check the number of doses you need to take to get your 100 percent. Most supplements are only taken once, but others require you take two or more doses per day. If you do not like swallowing pills, opt for a multivitamin that contains everything you need in one dose—or get vitamin injections. 4. Consider your age and gender. The nutrients your body needs changes over time, and requirements are different for men and women. Multivitamins designed for women typically have more calcium, iron, and folic acid while multivitamins for men have less iron and more niacin, vitamin E, and vitamin C. Vitamins for seniors take into account the fact that nutritional absorption slows down after age 50, so you need more of everything to maintain your health. 5. Look for specialized formulas. Multivitamins come in all shapes and sizes with different audiences in mind. For example, you can find specific vitamins that have more antioxidants or are designed for prenatal health. If you have a specific need to fulfill, look for a multivitamin that fits the bill. 6. Only buy a vitamin that has the U.S. Pharmacopeia (USP) label. The USP label assures the vitamin has been regulated and tested; it ensures the product is pure and contains the ingredients listed on the label. How you choose to take your multivitamin is up to you, although rates of absorption do vary between methods. Liquids and injections are absorbed that fastest while gel-coated pills take longer for the stomach to break down the coating and absorb the vitamin. When you take your vitamin is also up to you, although you should be consistent in your timing. Taking the vitamin with food will prevent nausea and stomach upset. When considering taking a multivitamin, a concern some people have is the possibility of overdosing on vitamins. While some vitamins–especially those of the fat soluble variety like vitamins A and E–can be toxic in extremely high doses, it is highly unlikely you will overdose on vitamins from food and supplement alone. The risk of deficiency is far greater than the risk of overdosing. Lastly, remember that vitamins become less potent over time. Vitamins nearing or past their expiration date will be less effective, and storing your vitamins in a hot and humid environment also decreases their effectiveness. Keep your multivitamins in a cool, dry place that is out of reach of children to enjoy maximum benefits. Do you have any further questions that were not covered in this post? Please feel free to contact us and we will be happy to answer any enquiries that you may have. 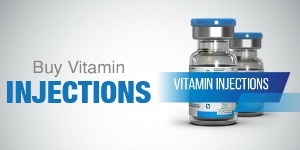 We can provide you with various vitamin injections that have a combination of helpful nutrients. Check out the multivitamin options we have available.